Through our Office of Student Conduct, members of the Pitt community may address alleged violations of the Student Code of Conduct. Student Conduct is an impartial body, providing fair process, education, and developmental opportunities for all involved parties. We invite students to become involved in the system by serving on our Judicial Board. 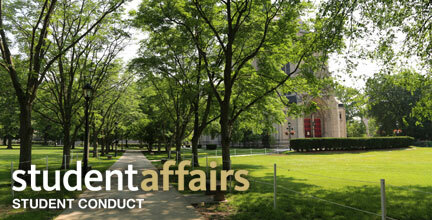 Faculty and staff members can engage in professional development by becoming Hearing Officers. The Judicial Board and Hearing Officers determine whether an accused student is found responsible for violating the charge(s) as alleged. If a student is found responsible, the Judicial Board and Hearing Officers recommend sanctions to the Vice Provost and Dean of Students. Additionally, we provide disciplinary clearances for students as requested for scholarships, Study Abroad, and employment.